My Life to Live (French: Vivre sa vie : film en douze tableaux; To Live Her Life: A Film in Twelve Scenes) is a 1962 French New Wave drama film directed by Jean-Luc Godard. It was released as My Life to Live in North America and as It's My Life in United Kingdom. The DVD releases use the original French title. Nana (Anna Karina), a beautiful Parisian in her early twenties, leaves her husband and infant son hoping to become an actress. Without money, beyond what she earns as a shopgirl, and unable to enter acting, she elects to earn better money as a prostitute. Soon she has a pimp, Raoul, who after an unspecified period agrees to sell Nana to another pimp. During the exchange the pimps argue and Nana is killed in a gun battle. Nana's short life on film is told in 12 brief episodes each preceded by a written intertitle. In Vivre sa vie, Godard borrowed the aesthetics of the cinéma vérité approach to documentary film-making that was then becoming fashionable. However, this film differed from other films of the French New Wave by being photographed with a heavy Mitchell camera, as opposed to the light weight cameras used for earlier films. The cinematographer was Raoul Coutard, a frequent collaborator of Godard. One of the film's original sources is a study of contemporary prostitution, Où en est la prostitution by Marcel Sacotte, an examining magistrate. Vivre sa vie was released shortly after Cahiers du cinéma (the film magazine for which Godard occasionally wrote) published an issue devoted to Bertolt Brecht and his theory of 'epic theatre'. Godard may have been influenced by it, as Vivre sa vie uses several alienation effects: twelve intertitles appear before the film's 'chapters' explaining what will happen next; jump cuts disrupt the editing flow; characters are shot from behind when they are talking; they are strongly backlit; they talk directly to the camera; the statistical results derived from official questionnaires are given in a voice-over; and so on. The film also draws from the writings of Montaigne, Baudelaire, Zola and Edgar Allan Poe, to the cinema of Robert Bresson, Jean Renoir and Carl Dreyer. And Jean Douchet, the French critic, has written that Godard's film "would have been impossible without Street of Shame, Kenji Mizoguchi's last and most sublime film." Nana gets into an earnest discussion with a philosopher (played by Brice Parain, Godard's former philosophy tutor), about the limits of speech and written language. In the next scene, as if to illustrate this point, the sound track ceases and the images are overlaid by Godard's personal narration. This formal playfulness is typical of the way in which the director was working with sound and vision during this period. 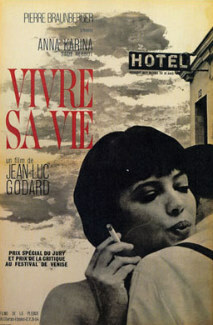 The film depicts the consumerist culture of Godard's Paris; a shiny new world of cinemas, coffee bars, neon-lit pool halls, pop records, photographs, wall posters, pin-ups, pinball machines, juke boxes, foreign cars, the latest hairstyles, typewriters, advertising, gangsters and Americana. It also features allusions to popular culture; for example, the scene where a melancholy young man walks into a cafe, puts on a juke box disc, and then sits down to listen. The unnamed actor is in fact the well known singer-songwriter Jean Ferrat, who is performing his own hit tune "Ma Môme" on the track that he has just selected. Nana's bobbed haircut replicates that made famous by Louise Brooks in the 1928 film Pandora's Box, where the doomed heroine also falls into a life of prostitution and violent death. In one sequence we are shown a queue outside a Paris cinema waiting to see Jules et Jim, the new wave film directed by François Truffaut, at the time both a close friend and sometime rival of Godard. Vivre sa Vie enjoys an extremely positive critical reputation. On review aggregator Rotten Tomatoes, the film holds an approval rating of 93% based on 29 reviews, with an average rating of 8/10. Author and cultural critic Susan Sontag described it as "a perfect film" and "one of the most extraordinary, beautiful, and original works of art that I know of." According to critic Roger Ebert in his essay on the film in the book The Great Movies, "The effect of the film is astonishing. It is clear, astringent, unsentimental, abrupt." ^ a b c Archer, Eugene (27 Sep 1964). "France's Far Out Filmmaker". New York Times. p. X11. ^ Sterritt, David (1999). The Films of Jean-Luc Godard: Seeing the Invisible. Cambridge University Press. Retrieved 1 March 2017. ^ "My Life to Live (It's My Life) (Vivre sa vie: Film en douze tableaux) (1962)". Rotten Tomatoes. Retrieved 15 February 2018. ^ Susan Sontag, On Godard's Vivre sa vie, Moviegoer, no. 2, Summer/Autumn 1964, p. 9. ^ "Roger Ebert, "Great Movies" - Vivre sa Vie/My Life to Live". Rogerebert.suntimes.com. 2001-04-01. Retrieved 2012-02-06. Roland-François Lack, Vivre sa vie: An Introduction and A to Z , (episodic essay on watching this film, with a selection of stills), Senses of Cinema, Issue 48, August 2008. This page was last edited on 12 February 2019, at 22:13 (UTC).